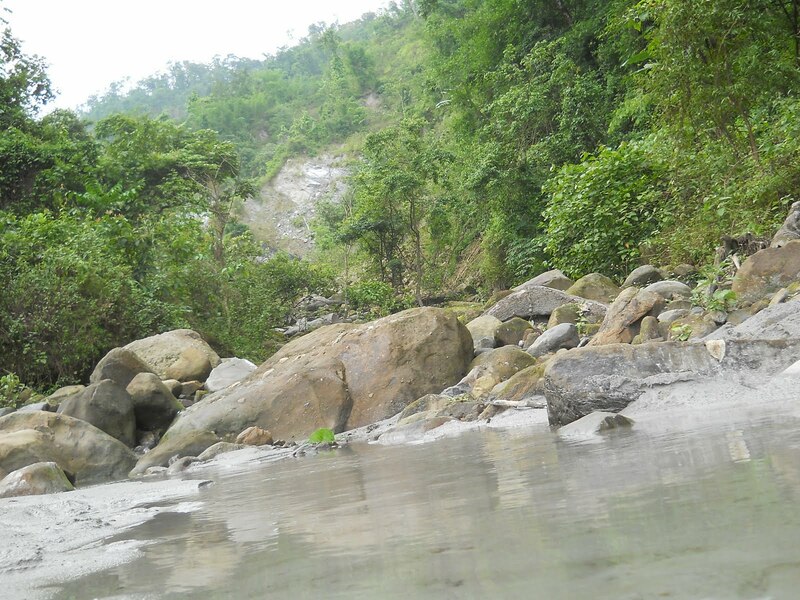 14 kms of wavy terrains filled with green lusciousness of Buxa Tiger Reserve forest, with the murmur of sweet chants of the streams, chirps of birds and flash of butterfly will reach you to one of the most remote in-habitations on earth - Aadma. The place reminds us of the ancient lifestyle of nomadic cultures. The most attractive and also the most pitiful thing of these unknown paradise are the smiling and innocent faces of this place. 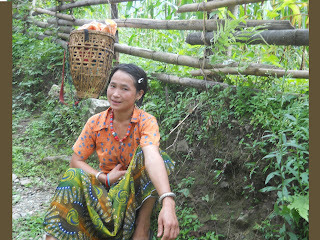 The tribe 'Dukpa' of these places live a nomadic life with their families. 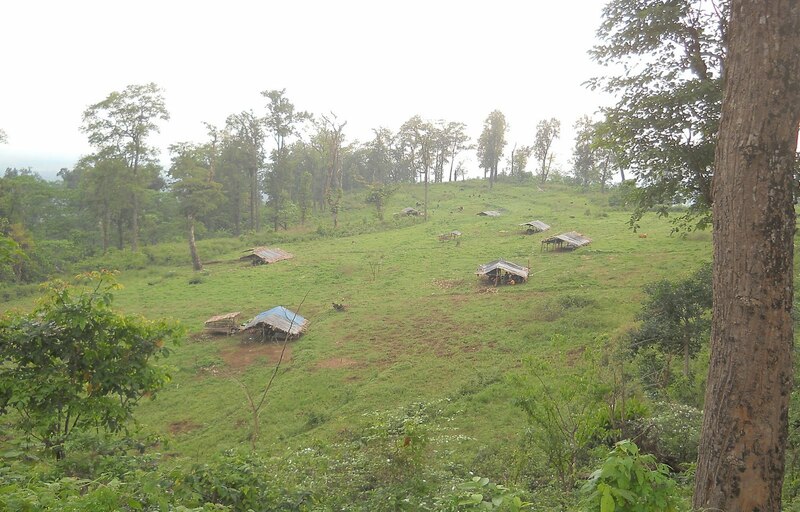 Most of the months are spent in forest for cattle grazing and when the rainy season approaches, they all gather in the village to share their wild experience. The place is isolated from all the rightful facilities of health, education, sanitation, transportation and every basic needs a community requires in today's age. It sounds quiet absurd knowing that the place is under the jurisdiction of Indian Govt. Precisely, if asked, hardly any one would give you the name of the country and state they live in. The thatched roofs, and huge wooden houses prove their sole reliability to the natural resources they live in. They hardly care about the concerning issue of ecological imbalance and live in a world of their own. The innocent wrinkled faces of experienced villagers recite the way of their livelihood which will certainly bring the fact of globalized world into the circle of doubtful impressions. A couple may have children more than 12 in numbers.India is taking strict measure on population control but it's centralized policies hardly reach to the senses of these innocent people who are scared to face the reality of civilized world. People die like their cattle, hats off to their positive attitude, hardly a mark of complain is seen on their faces. 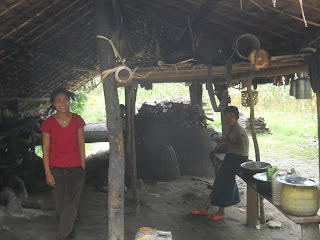 Their hearts are as big as their houses which have been built by the processed wood. As the people practice Jhoom farming, a method of farming mainly practiced by the nomadic people as they do not stay in one place, they do require some knowledge regarding farming to make them settle at one place. We the intellectuals, philosophers , nature conservationists, boast about our works and complain about our unsatisfied demands to the whole world, whole life. 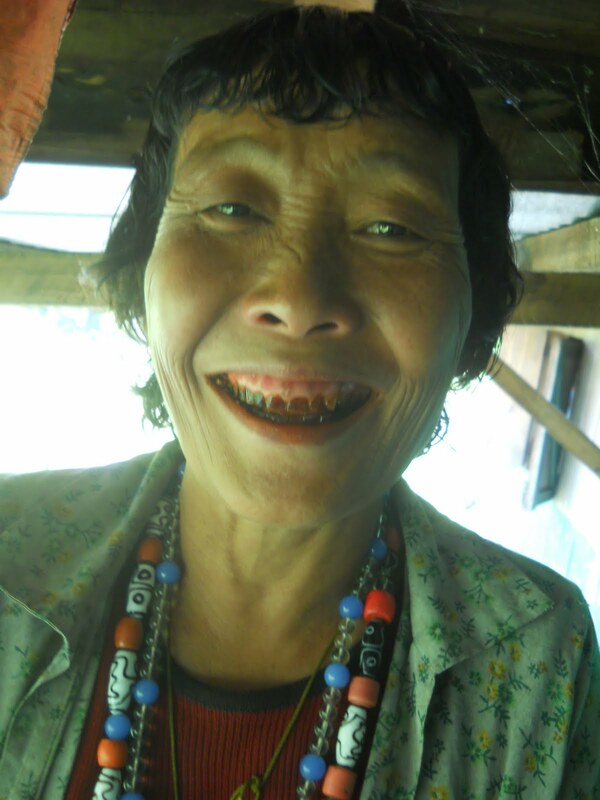 These chastened smiles have no complains as they are thankful to the nature who provide them with all the minimum requirement of necessities of life. It's a call for all the nature lovers to raise hands to support these community which will also save the nature. The main objective should be to provide a sustainable livelihood to these people along with the provision of education and health benefits. These areas are full of resources to be utilized, with its incredible beauty of flora and fauna. The rest can only be experienced by availing their warm hospitality and cozy shelter. 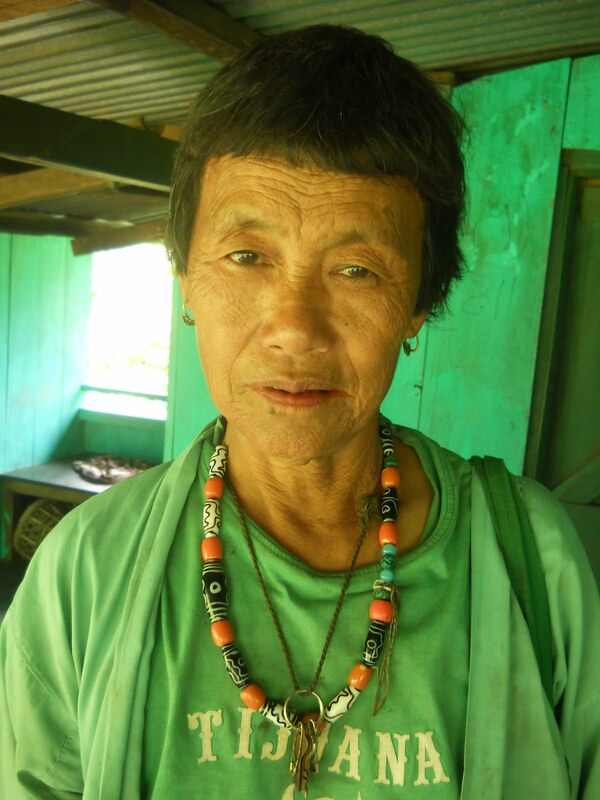 The nature lovers can go for a short moderate trek through Santal Barie, a forest village inRajabhatkhawa, all the arrangements can be availed at theSantal barie village with experience guide and potters. 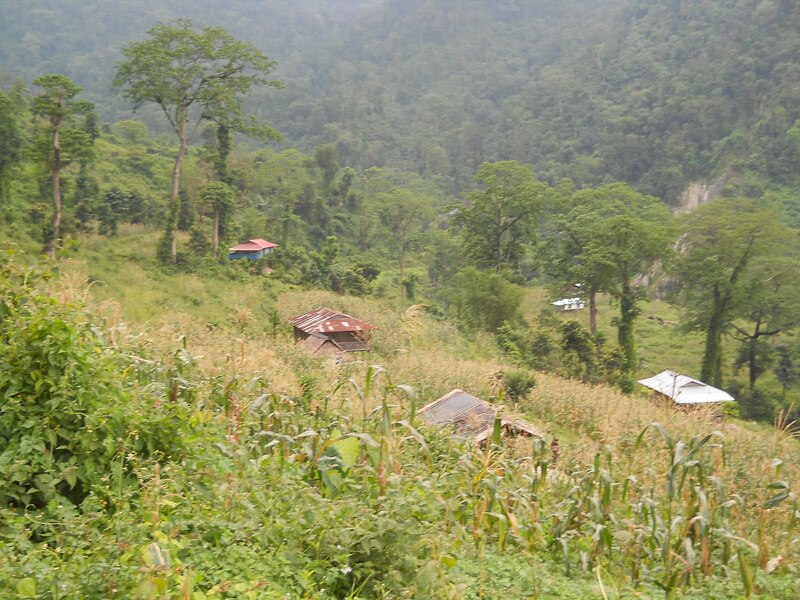 The trip will certainly leave you with unforgettable memories of the colourful butterflies, medicinal plants, birds and if lucky enough, the sight of a wild animal and above all the smiling faces of Dukpas of these remote places. 4. Home stay at Aadma along with food. 5. Local tea garden sight seeing through vehicle. selected sites in Nepal and Bhutan (BirdLife International, 2011). Thembang Bapu Community Conserved Area Wetland Complex, West Kameng district. In a world of rising energy prices, rising global temperatures, and rising sea levels, Americans are calling for clean and affordable energy. Yet under the influence of big energy companies, policy-makers are stubbornly clinging to the old, dirty fossil fuel technologies of the past. Along with global warming, mountaintop removal is an egregious example of the destructive impact of our addiction to coal. ----------Jamrunmahali is part of the Adarsh Gaon Yojana (AGY), Maharashtra’s Ideal Village Scheme, made famous by its patron activist Anna Hazare​, and practicable by its charismatic figurehead, Popatrao Pawar, sarpanch (village council head) of Hiware Bazar, Ahmednagar. The scheme has been running since the 1990s in Hazare’s hometown, Ralegan Siddhi, and nearby Hiware Bazar, but Jamrunmahali is one of the newer recruits to the project. Me and my friends have started a small home based adopting and rescuing the tortoise and turtle. The main aim behind this is to support the species and stop them from getting away from our life. I got huge space to accommodate more then 100 Tortoise and we do have one doctor looking after them. Right now we do have some but all are males and i am looking to bring some females for their company :-) Kindly help me as much you all can. The labernum is in full bloom announcing the summer season ahead. 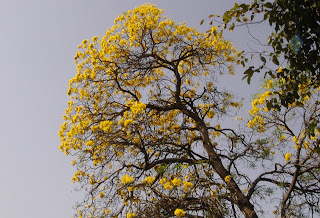 Labernum is native to India and is venerated by Indians as a "lucky charm". The pretty dangling flowers cannot be missed where labernum grows as avenue trees or as a tree welcoming one to a house. Another tree, the silver oak (Grevillea robusta)an exotic from Australia which is now very popular in urban parks, also blooms. Very few take notice, as the blooms quickly transform to seeds. 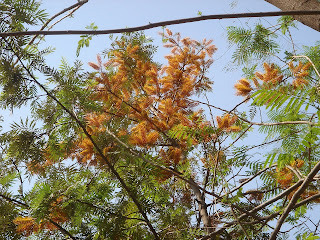 A fact which is least known about this tree is that its flowers and seeds are known to cause dermatatis. 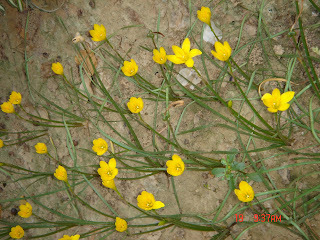 The flowers are golden-orange washing brush like blooms and are toxic. 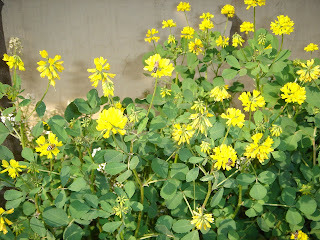 The ground is awash with yellow blooms as soon as it rains. Pretty lilies bloom to welcome the short rainy season in these parts. The yellow and white butterflies are common now. Not so common, is the yellow lemon pansy. The birds are busy nesting and bringing up new chicks to feed in the abundance of the rainy season. 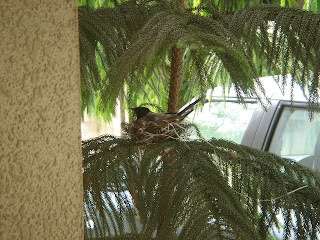 The bulbul decides to make her nest just outside our main door, on a Christmas tree. She has been very clever. 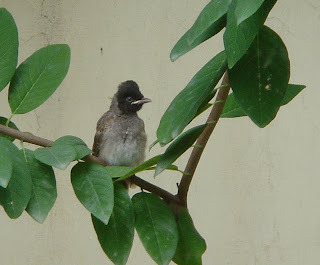 The tree pie is on the look out for eggs every day morning and one day we woke up to bulbul cries. Luckily the nest attacked was not the one near the door, but the one on a ficus tree outside the gate, on the main road. Her nest is resting on a branch near the wall of our house. No big bird can reach it. The height is such that the prowling alley cat will not jump at it either. But every time someone comes out of the house, the male or female(they take turns) sitting on the nest is disturbed and flies out to the nearest tree. We are honoured at the trust imposed by the bulbul in us. When the little chick flew out for the first time leaving the nest vacant, we celebrated. Bye bye season of yellows till next time! 10 New species of frogs! A team headed by Dr Anil Zachariah, a renowned scientist, has discovered 10 new species of frogs from the hill ranges of Southern Western Ghats with the help of Zoological Survey of India. “These findings show that Western Ghats, a biodiversity hotspot of the world still has many new species of amphibians,” Dr.Zachariah told Deccan Chronicle. Study author Dr Shermin de Silva from the University of Pennsylvania said: ‘Elephants are able to track one another over large distances by calling to each other and using their sense of smell. ‘So the “herd” of elephants one sees at any given time is often only a fragment of a much larger social group. • Reassure the victim who may be very anxious and scared. • Immobilize the bitten limb with a splint or sling (any movement or muscular contraction increases absorption of venom into the bloodstream. • Consider Pressure immobilization for bites by elapid snakes only like the Indian Cobra and the Indian krait including sea snakes but should not be used for viper bites because of the danger of increasing the local effects of the necrotic venom. There is considerable debate of which technique to be used and I have personally found the use of a local compression pad applied over the wound pressure bandaging of the entire limb to be very effective. • Avoid any interference with the bite wound as this may introduce infection, increase absorption of the venom and increase local bleeding. · The patient must be transported to a place where they can receive medical care (dispensary or hospital) as quickly, but as safely and comfortably as possible. Any movement, especially of the bitten limb, must be reduced to an absolute minimum to avoid increasing the systemic absorption of venom. If possible the patient should not be allowed to walk and carried with the help of a stretcher or bed or sitting on a chair, etc. Here is a write-up by Prof.Ulhas Rane who is moderating maharashtrapakshimitra@yahoogroups.com. It is a valuable piece of writing for all photographers. "The news in Loksatta and subsequent messages on various E-groups about the destruction of bird nests in Chandrapur forests in Maharashtra by a so-called wildlifer / nature photographer is shocking. It made me sad that the disease of unethical birdwatching / photography which emerged over the last 15 / 20 years has grown to such enormous scale, pehaps due to the advent of technology and easy availability of equipment - whether digital camera, powerful flashes, voice recorder or mobile phone. The market potential for such 'rare' items also increased due to mushrooming of glossy magazines, books, newspapers and even TV media. This is affecting our wildlfe adversely and would further destroy our already endengerd rare species of wildlife, particularly birds. I have noted and written / talked about unethical nature observations /photography / collection over the last over 25 years and there are simple 'dos and don'ts' everyone need to follow to not only enjoy nature experiences yourself but also to leave them undisturbed for the others to enjoy. Most of us are aware of such norms. However now we need to add more such guidelines / rules because of the advent ot technolgy and new tricks. Going in large groups in the wild regions, disturbing natural evosystems with over-active movements (sometimes called 'enthusiasm'! ), loud noise, throwing litter (now plastic water bottles), getting drunk and out of control (including throwing empty bottles particularly in the streams), shouting and screaming with excitement when one sees something new, collecting rare plants / flowers / insects etc. are common flaws incurred by many 'nature lovers'. getting down from the vehicle / elephant in the sanctuarlies / national parks (where one is not allowed to walk) to get a good picture of a rare butterfly or even to collect the same (this happens mostly by bribing forest guards / drivers / mahuts). This contiues to the next stage of trading wildlife as collection items / momentoes. The next category is wildlife photographers - Nest photography with insensitivity by carrying out 'gardening' (removing leaves, weeds, grass etc. around the nest) to get a better / clear picture. In a process, the nests are left prone to predators' attack and many times the birds are compelled to abandon them. The chicks are tortured / lured to open their beaks / give good poses etc. Powerful flashes are used to get 'bright & beautiful' pictures without considering that the creatures may get blinded. Then finally to have the exclusivity of one's rare picture, destroy the nest / animal so that no one else could get an opportunity. Many lure local tribals with money to show nests or attract / trap birds, animals using their traditional methods. Then this becomes another busines for tribals which is cleverly termed as employment generation / poverty alleviation! guarantee you of showing rare bird / animal so that you join such a tour by paying hefty amounts. All this is happenning because 'Wildlife' has become a big business and any business is likely to become exploitative. Unfortunately so called 'nature lovers' do not realise that they destroy the 'item' which fetches them money / fame / name. It is more unfortunate that it is being rampantly done under the garb of Nature Awareness / Study Programmes. Many times good wildlifers tend towards these tricks due to ignorance, over enthusiasm, competition, jealously or one-upmanship. Even when they are cautioned they become defensive and continue in what they believe! We must take strong action against this attitude and destructive behaviour of a few individuals which brings a bad name to the most beautiful hobby and entire fraternily of nature lovers. I am sure the forest department will take appropriate action in this particular case, but the authentic nature groups should also take initiative to cure this disease. It must be ensured that only serious wildlife researchers are allowed to collect data using right techniques for scientific purpose, and that too after obtaining requisit permissions from the forest department / authorities, however difficult it may be. We need to inculcate simple ethics in upcoming nature lovers by making them experience / enjoy the natural ecosystem. Calls, pugmarks, scratch marks, smells etc. 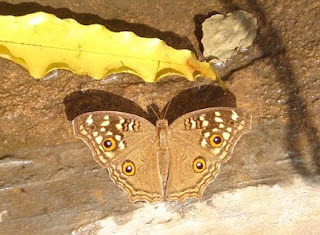 are the evidences of the existance of wildlife in the ecosystem and one should enjoy the excitement of being a 'nature detective'. This would give you satisfaction, provide you more enthusism even though you may not have 'seen' a single creature. Seeing is of course fun and that eventually comes when you become 'wild', go again and again without disturbing the natural environment and become a part of ecosystem. Such love for nature would culminate to wildlife study and nature conservation. We should enjoy nature by following simple ethics of doing what is good for wildlife.